CLARIS Titanium Instrumentation is specifically adapted to lumbo-sacral and thoraco-lumbar arthrodesis. The benefits of CLARIS are quick and easy implementation, reduced operating time, and MRI compatibility. The omniaxial connector is designed for the protection of the cranial facet joint when used in the upper part of the construct. The omniaxial connector offers the perfect balance between strength and adaptability. The omniaxial connector provides the ultimate solution to the surgeon to link the pedicle screw to the rod, without stressing the surrounding anatomical structures. Spine surgery technique has evolved since the fixation of spinal deformities by Paul Harrington. Fixation techniques have been enhanced with the use of pedicular screws by Raymond Roy Camille in France and Arthur Steffee in the USA. 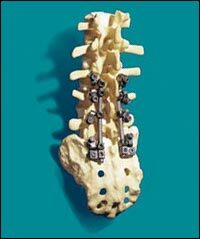 Today, many systems have been developed and are used for the fixation of the different segments of the spine. These systems often combine pedicle screws, rods, and connecting devices. Most of the fusion techniques in lumbosacral arthrodesis are commonly used by spinal surgeons. Nevertheless, technical difficulties can occur due to anatomical changes in the pedicle. While connecting the rod to the screws, fixations must be achieved quickly. 1. substancial reduction in operating time. 2. quality of bone anchorages due to lack of strain, particularly for elderly patients for whom bone strength is low. 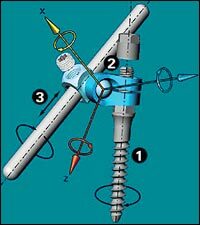 2. tightening of the set screw on part 2 of the omniaxial connector, thus locking the rotation and the translation of the rod. An added advantage is that realization of the construct avoids any conflict with the cranial facets joints at the upper limit of the fixation. Available in titanium, this device is compatible with the X-ray and MRI postoperative examination. The instrumentation is easily mastered enables high standard spinal surgeries.